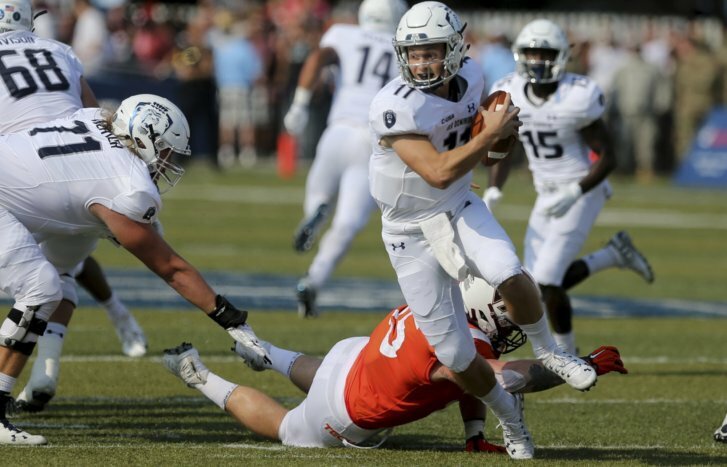 Blake LaRussa came off the bench to throw for 495 yards and four touchdowns to lead Old Dominion to a 49-35 upset of No. 12 Virginia Tech on Saturday. NORFOLK, Va. (AP) — This was supposed to be a relatively easy road trip for Virginia Tech. Cross the state, connect with some its fans and maybe a few recruits there, and pick up a routine victory against Old Dominion. LaRussa, who entered the game on ODU’s second series, completed 30 of 49 and rushed for a touchdown to lead the 28½-point underdog Monarchs (1-3) to a stunning win over the Hokies (2-1) from the Atlantic Coast Conference. Virginia Tech started the season with a decisive victory as an underdog against Florida State and now the Hokies are on the receiving end of what will likely be one of the biggest upsets of the season. The Hokies led 28-21 after a 72-yard touchdown pass from Josh Jackson to Damon Hazelton with 32 seconds left in the third quarter, but ODU scored on its next two possessions, taking a 35-28 lead on a 15-yard touchdown run by Cox with 9:57 to go – the Monarchs’ first lead of the game. Steven Peoples paced the Hokies with a career-high 156 yards rushing and two touchdowns. Jackson threw two touchdown passes before leaving with the injury. Fuente did not have an immediate update on Jackson’s condition. Virginia Tech: The Hokies looked flat coming off an unscheduled open week courtesy of Hurricane Florence, which forced last Saturday’s cancellation of Virginia Tech’s game against East Carolina. The Hokies’ defense looked nothing like the unit that had given up just 20 points combined in the first two games. ODU: The Monarch appear to have found a leader in LaRussa, who came into the game with 183 yards passing as a reserve, but surpassed that in the first half. The 5-foot-11 LaRussa showed uncanny accuracy against Virginia Tech’s man coverage, taking advantage of the 6-foot-3 Duhart and 6-3 Travis Fulgham (188 yards). He may just be the spark the Monarchs needed after getting off to a dismal 0-3 start that included losses to Liberty, FIU and Charlotte. “It’s inexcusable,” Fuente said. “What happened was we got in the middle of a real game – a real competitive game and things weren’t going our way, and that’s how we responded. And that’s inexcusable.